Henry, Jessie, Violet and Benny, four orphaned brothers and sisters, suddenly appear in a small town. No one knows who these young wanderers are or where they have come from. Frightened to live with a grandfather they have never met, the children make a home for themselves in an abandoned red boxcar they discover in the woods. Henry, the oldest, goes to town to earn money and buy food and supplies. Ambitious and resourceful, the plucky children make a happy life themselves--until Violet gets too sick for her brothers and sister to care for her. This unabridged recording will delight any child who has fantasized about being on his or her own and overcoming every obstacle. Gertrude Chandler Warner, a teacher, wrote bookss that were both easy and fun to read. 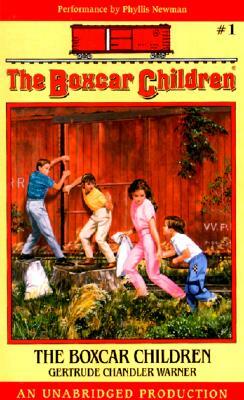 This story, like the other 18 in the now-classic Boxcar Children series, which has sold over 3 million copies in paperback, features children solving problems and acting responsibly without the supervision of adults. Gertrude Chandler Warner was a lifelong resident of Putman, Connecticut, until her death in 1979 at the age of 89. Phyllis Newman began her career as a child entertainer in vaudeville. She later gained recognition as a gifted entertainer in many Broadway productions, earning a Tony Award for her role in Subways Are For Sleeping. Phyllis also appears on television series wuch as One Life To Live and "thirtysomething".